So you have full access to the entire range of Canon EF and EF-S lenses. This adaptor enables the use of all lenses from EOS to EOS M System to use, compatible with Canon EF and EF-S lenses. So your lenses, which are already in its possession, including the EOS M use. 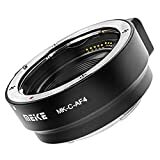 With the Meike MK-C-AF4 lens adapter, you can use the EF and EF-S Lenses with your Canon DSLR Camera and now to your EOS M camera without restrictions of use, they may be professional-quality images with its high-quality lenses Shooting without fear to the decline in stock. bayonets are made of a Particularly robust metal and thus ensure that the camera lens securely to the sitting on the gold-plated contacts, the communication between the camera and the lens so as to ensure such as the setting and focusing reliably aperture of the time. This entry was posted in Discount Photography and tagged Adapter, Canon, MKCAF4, MMeike, Ring by Ball Photo. Bookmark the permalink.